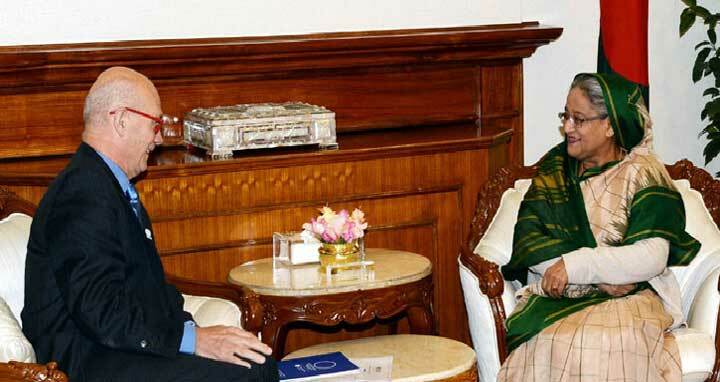 Dhaka, 8 Jan, Abnews: France government's consultant and Former Director General of the World Trade Organisation (WTO) Pascal Lamy made a courtesy call on Prime Minister Sheikh Hasina at her Tejgaon office here yesterday. Pascal Lamy conveyed the Prime Minister about his country's interest in hosting the World Expo-2025, seeking Bangladesh support, PM's press secretary Ihsanul Karim said. France has set the theme of the World Expo-2025 as "Knowledge to Share, Planet to Care," Karim said as Lamy told the Prime Minister. Pascal Lamy praised Bangladesh's economic development under the leadership of Prime Minister Sheikh Hasina. Sheikh Hasina highlighted Bangladesh's economic progress over the years saying now the country is trying to tap the potentials of the blue economy.